I’ve never killed an alien with our Wii console. None of the games we own involve first persons shooting anything. In fact, I’m pretty sure none of the characters therein are capable of dying. Unlike more heavily-marketed game consoles, Wii is pastoral, social and very nearly uplifting. If you’re not careful, you might switch it off and find yourself still humming the background music that accompanies its games. You can buy vicious, blood-soaked carnage-fest games for Wii, of course… you just aren’t required to. The Wii console comes with Wii Sports, a disc of games including a synthetic golf course and an imaginary bowling alley. Wii Sports is about the most fun you can have with a remote control in your hand, and we’ve played it on and off for several years. …after which time we would have killed real aliens for a disc with a different golf course on it. 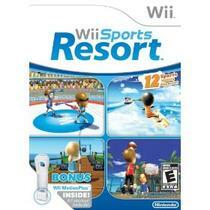 Wii Sports Resort is the original Wii Sports disc pumped up on enough steroids to be seen from space. It’s arguably the disc everyone who bought a Wii console to do something other than blast at moving targets has been waiting for since Wii was first released. While it offers innumerable diversions, it successfully maintains the happy, surreal alternate universe of bright, saturated colors, legless Mii characters and questionable adherence to the laws of physics that made the original Wii Sports disc such a glorious time-waster. One of the aspects of Wii Sports Resort that makes its games so much more sophisticated than the original Wii Sports is an accessory for the Wii controller devices through which said games are played. The Motion Plus attachment plugs into the bottom of a Wii controller to allow Wii’s games to know precisely where a remote is from one millisecond to the next, and how it’s moving. It allows for much more nuanced control of Wii’s on-screen characters. It’s worth noting that Wii Sports resort comes with one Motion Plus device. You’ll actually need one for each Wii controller that will be used to play Wii Sports Resort. You’ll almost certainly have to spring for at least one more Motion Plus accessory. The Motion Plus devices aren’t optional for Wii Sports resort – its games can’t be played unless all your Wii controllers are suitably equipped. Wii Sports Resort is dead easy to install on a Wii console – just boot up its DVD and select the Wii Sports Resort item from Wii’s main menu. At least in our case, the initial installation was fairly time consuming, as it insisted on upgrading the console’s operating system. Then it played an “instructional video” to explain how the Motion Plus device works. The video lacked an “abort” option, and its voiceover sounded exactly like the narrator for an in-flight safety video. I wanted to find a packet of stale peanuts and drown her out with loud crunching. It must be said of the Motion Plus device that it succeeds admirably in providing the game with much more lifelike responses to the hand movements of whoever’s holding one. This may not, however, appear to be entirely beneficial when you first fire up Wii Sports Resort. Seasoned players will find they need to re-learn how to use the Wii controllers, which will have become twitchy and nervous. Plan on some really embarrassing scores for the first few nights. We bought Wii Sports Resort primarily for the promise of more imaginary golf – I’m unable to account for the attraction of Wii golf, having had little but disparaging things say of real golfers. The new “resort” course consists of nine holes, with the “classic” course from the original Wii Sports disc still on tap as the back nine. In addition, at such time as you achieve a reasonable level of proficiency on the resort course, the game will unlock a further three hole “special” course. The special course is truly demonic – anything better than par on it calls for a celebration lasting well into the night. The Wii resort course is as expertly crafted as its predecessor. It succeeds in being challenging without becoming frustrating, and it lacks the complexity of third-party golf simulators. It makes excellent use of the Motion Plus device to simulate real golf clubs and real golf balls. The ensuing real profanity will, of course, be the responsibility of whoever plays it. Unlike the original Wii Sports course, this one offers a full bag of clubs. This having been said, I wouldn’t have minded a Callaway Big Bertha Diablo combination driver and elephant stunner on some of the holes. As with the original Wii Sports golf course, much of the fun of the resort course is in scoping out its tricks and secrets. All the odd bits of terrain are there for a reason. The traditional alleys of Wii Sports Bowling don’t do anything more than they did in the original Wii Sports, although they do it with better control. The hundred-pin lanes, however, take lobbing bowling balls to an entirely different stratum. Knocking down a hundred pins with a single throw is ecstatically satisfying. Wii Sports Resort offers numerous additional diversions. You can throw a Frisbee across an imaginary beach, to be fetched by an imaginary dog after it pops imaginary five-story propeller-driven orange balloons… if you ever see any of the latter on a real beach, you need to refuse any more of those colorful little drinks with paper umbrellas in them. You can also play Frisbee golf – which takes place on the resort golf course, and involves using Frisbees to shatter a translucent beam of light that rises up where the holes would otherwise be. Some of the Wii Sports resort games – sky-diving, sword fighting, canoeing and so on – are more fun to look at than they are to play, and they’re probably better suited to kids than to adults pretending to be kids. Your mileage will unquestionably vary, and one of the more engaging aspects of Wii Sports Resort is that it will quickly spoil you for choice. To be sure, we’ve never encountered a real resort with anything like this much to do, or this many people who never stop smiling. Surprisingly inexpensive and worth whatever it costs, Wii Sports Resort is like discovering Wii all over again. It’s instantly addictive, and difficult to switch off. The Play Again button just never seems to go away. Play it for a week and you’ll completely forget what dead aliens look like.